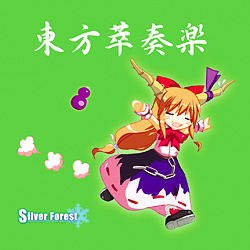 Silver Forest is a doujin music circle who produces remixes and rearrangements of music from the Touhou series. Not to be confused with the more well-known IOSYS, I believe Silver Forest produces songs that are typically more faithful to it's original works, but that is not to say I have any preference over IOSYS or Silver Forest; they both make innovative, and insane interpretations of the Touhou works. That being said, this album has some very relaxed, simple orchestrated instrumentals, warm electro-pop, as well as the fast-paced typical loli-styled songs that one would typically associate with any doujin music circle, especially one focused on something like Touhou. Enjoy. Hey do you have Death Composition by E.D.P.S.? Richard- I actually haven't heard that one yet! I need to definitely track that one down, I love his work with Albatrosicks as well. Anonymous- Unfortunately, I don't. I can ask around though, I'm definitely digging the songs that are on YouTube.